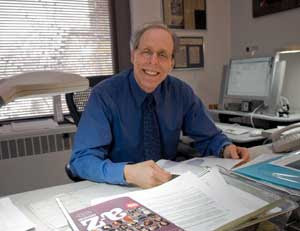 Edward A. Wasserman is a professor of psychology at the University of Iowa. Work in Ed's lab focusses on animal cognition and perception and the similarities and differences between humans and non humans in categorization, perception and memory. I could write this great long biography of Ed, but, you know what? There is a great long biography of Ed online, so you could go read it! (There's also Ed's wikipedia article, which some editor named 'dbrodbeck' wrote). Among other things it mentions that he started out as a physics major, that he spent a year with a major of 'undecided' (I love that) and that he has been interested in the big problems and little problems in animal learning and memory for 40 odd years. I first met Ed at a conference at Dalhousie University in 1989. I was a lowly MA student in Sara Shettleworth's lab. Sara sent me to this thing and it literally changed my life. I got to meet people like Ed and Al Kamil and I realized that there was just so much cool stuff out there and that the range of problems we can look at is mind boggling. We talked about how Ed got into the field, his theoretical stance and how it relates to violins (really) and of course his recent paper about cancer detecting pigeons. Ed and his colleagues and students have been working on big questions like discrimination and categorization for a long time. In 2015 the Comparative Cognition Society recognized Ed's work by having him give the master lecture at CO3.